Learn how to make an Easter treat recipe that you can place in Easter baskets. These would be ones like the candy Easter eggs or other Easter shapes. The mini cakes are another good choice. After the decorating is complete, give it time to dry or “set up”. These can then be placed in the basket after wrapping in clear plastic wrap or it you choose they can be placed in the basket unwrapped and then wrap the entire filled Easter basket to keep everything fresh. You can learn how to make an Easter treat recipe which would be a good tasting snack to offer guests who visit during the Easter season. In this category, good selections would be muffins, cookies, coffee cake, pie, etc. These are very welcoming to offer to visitors along with a fresh hot cup of coffee or tea. 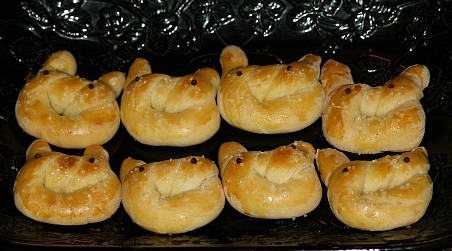 I learned how to make various Easter treat recipes which I use to make up serving platters. This might consist of cookies, cupcakes, homemade Easter candies, pretzels, and slices of bread or anything easy to serve like these. I wrap each of this in clear plastic wrap, and then arrange them on a bed of Easter grass. When family members or guests want an Easter treat recipe, these are conveniently ready for them to eat. Cook sugar, syrup and water in saucepan to 265F degrees. Add marshmallow cream and beat until almost firm. Add melted shortening, powdered sugar, candied fruit and nuts. Mix well; shape into 10 egg shapes by hand. Dip eggs into melted chocolate. Cream butter and sugar until fluffy; beat egg whites until stiff. Fold in pineapple and nuts; fold in beaten egg whites. Using 3 vanilla wafers for each, filled in between with mixture. Place each nest on tray and place in freezer until firm. Dip tops each frozen nest in sweetened whipped cream. Top with green coconut and place jelly beans on top. Place back in freezer until ready to serve. This wacky cake recipe makes chocolate Easter eggs to serve as an Easter treat recipe. Combine flour, sugar, cocoa, baking soda and salt in a large mixing bowl. Add water, oil, vinegar and vanilla; beat on medium until well blended. Pour batter in greased and floured egg molds. Bake at 350F degrees for about 12 minutes or until pick comes out clean. Top with pourable fondant and decorate with frosting. Place sugar in saucepan; combine water and corn syrup. Add corn syrup mixture to sugar and stir until blended. Cook over low heat; USE CANDY THERMOMETER and do not let mixture get over 100F degrees. Remove from heat and stir in almond and color; allow to set before covering eggs. Place egg cakes on rack over drip pan; pour fondant in center and work toward edges. Touch up bare spots with spatula or knife; extra fondant can be reheated. 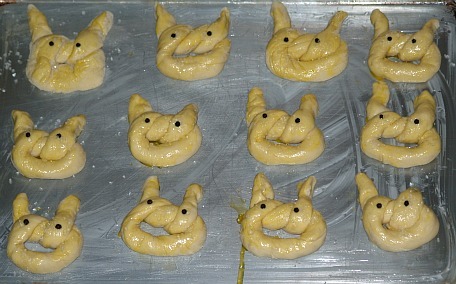 Let fondant set up before decorating eggs with frosting. Mix flour, granulated sugar, baking powder, soda, salt and almonds in a large mixing bowl. Form a well in the center; in small bowl combine milk, orange juice, butter, egg and orange juice. Pour liquid mixture into the well of the flour mixture; lightly mix to blend. 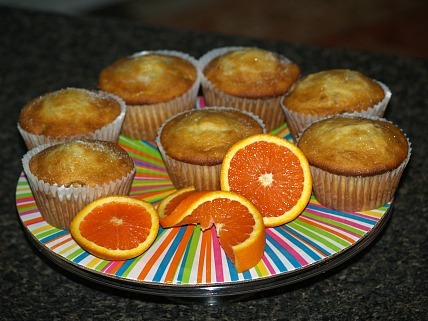 Spoon mixture evenly into paper lined muffin tins; sprinkle tops lightly with powdered sugar. 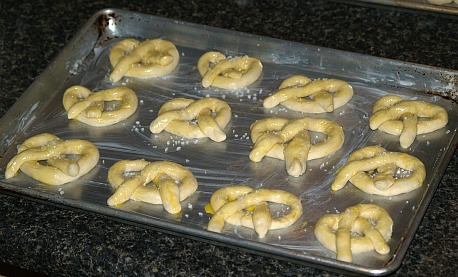 Bake about 20 minutes or until pick comes out clean; remove to rack to cool. In large warm bowl dissolve yeast in warm water. Add to yeast mixture the sugar, 2 teaspoons salt, butter, egg and 3 cups flour; beat until smooth. Add enough additional flour to form soft dough. Cover tightly with foil and store in refrigerator for 2 hours. Divide dough in half; cut each half into 16 pieces. On lightly floured surface roll each piece into 20 inch long pencil shape. Brush with a mixture of egg yolk and 2 tablespoons water; sprinkle lightly with coarse salt. Cover and let rise in warm place about 25 minutes or until doubled in bulk. Bake at 400F degrees for 15 minutes or until lightly browned; cool on wire rack. 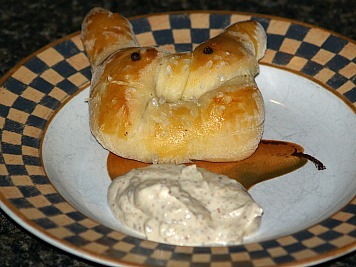 To make dip combine and blend mayonnaise and mustard.